Last year as I was perusing soap at the Ballard Farmers Market I came across some rather interesting ‘Man Soap’. It was chunky, scented with sage and pine, and immediately got my attention. What I loved most about it was the shape, colour, and leaf decoration and I couldn’t wait to try making my own. This recipe is my take on it with a simple fragrance blend that both men and women will like. In fact, it’s probably my new favourite! Cedarwood and Lemongrass. This recipe will make three chunky bars if you pour the batch into a regular 40-44 oz silicone loaf mould. 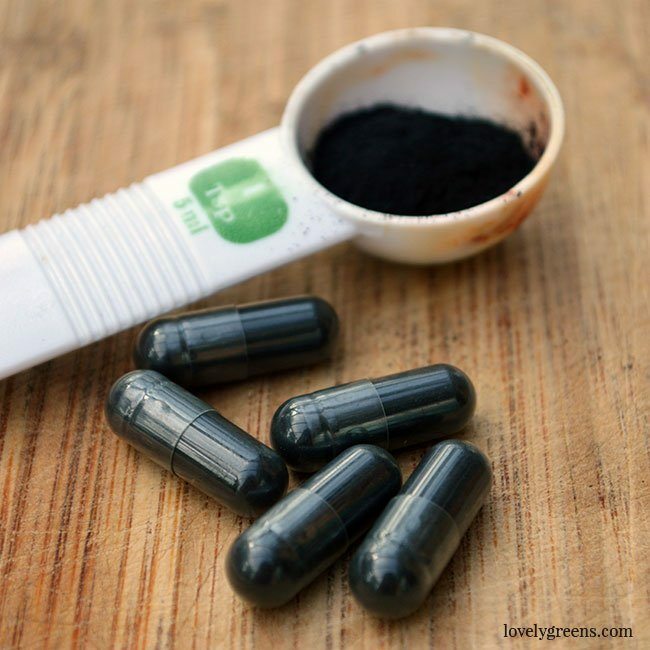 The activated charcoal that you add to the liquid oils will give the finished bars a pleasing blue-grey colour but if you want it to be darker feel free to double the amount. After curing, the bars will be hard, the lather fluffy, and the lashings of shea and cocoa butters make the soap super moisturising. If you’ve not made natural soap before, I highly recommend you have a read of my free 4-part natural soapmaking series. It will help you to understand the directions below a lot better. The steps laid out are very similar to the method described in part 4 of the series, with the addition of charcoal into the liquid oils and the cyprus cedar leaves for decoration. Safety first! Make sure to be wearing closed-toe shoes, long sleeves, eye protection (goggles), and latex or washing-up gloves. You’ll be working with Sodium Hydroxide (Lye) and splashing a bit on your skin isn’t the most pleasant of experiences. To learn more about lye and lye safety read this piece on the equipment and safety needed for soapmaking. Solid oils measured into a small stainless steel pan. Mould set out and ready. You’ll also need a light towel so have that ready too. Read all of the directions thoroughly before making your soap. Wearing eye and hand protection (goggles & gloves) and in a well-ventilated place, pour the lye crystals into the water. The water should be measured out into a heat-proof plastic jug. Stir well with a stainless steel spoon until fully dissolved, trying not to breathe in the steam. 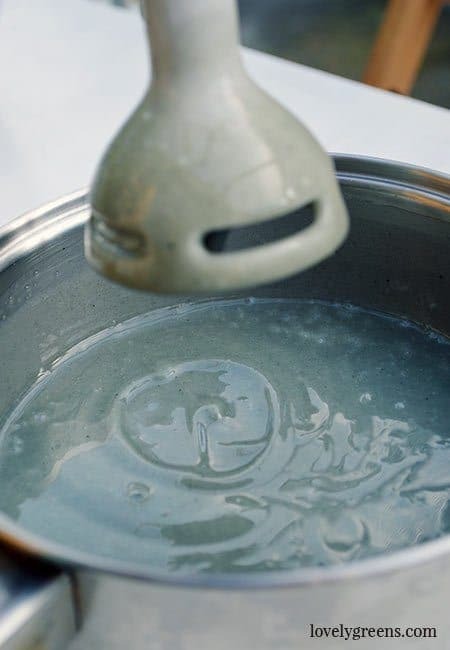 Place the jug of lye solution in a small basin of water to cool down. The water gets super hot when you mix in the lye! I usually fill my sink with water and place the jug in there. Place all of the solid oils into a pan and place it on the stove. Begin melting them at the lowest heat setting. Blend the charcoal powder into a little of the sunflower oil with a milk frother or spoon. When there are no lumps left, pour it into the rest of the liquid oils and stir well. When the solid oils have just finished melting, take the pan off the heat and mix in the charcoal tinted liquid oil. Pour the tinted oil through a mesh strainer to ensure you catch any chunks of charcoal that weren’t completely mixed in. Stir and take the oil’s temperature — I mixed my soap at 125°F / 52°C. You can comfortably mix yours when the oils are between 110°F and 130°F. The warmer the oils, the more intense the colour will be though. When the oils are at the temperature you want, it’s time to mix in the lye solution. You need to take its temperature too and it should be within ten degrees (plus or minus) of the temperature of the oil. If you’re adding the optional Sodium Lactate (to make the soap harder) then stir it into the lye solution when it’s below 130°F / 54°C. Pour the lye solution through the mesh strainer and into the pan of oils. When the lye and oils combine properly, they ‘Saponify’ and become soap. You use a stick (immersion) blender to help this process and you know you’ve succeeded when your oils and lye solution begin to thicken up like in the photo below. You do this by alternating stirring with gentle pulsing, always keeping the head of the blender submerged in the soap batter. I made a video showing the technique I teach in my soap making lessons in this video on how to make Lemongrass soap. While you’re over there on YouTube, make sure to subscribe to my channel. When your soap has hit ‘Trace’, stir in the essential oils and optional Grapefruit Seed Extract. The former is your fragrance and the GSE helps to prolong shelf-life in a natural way — it’s an antioxidant rather than a preservative. 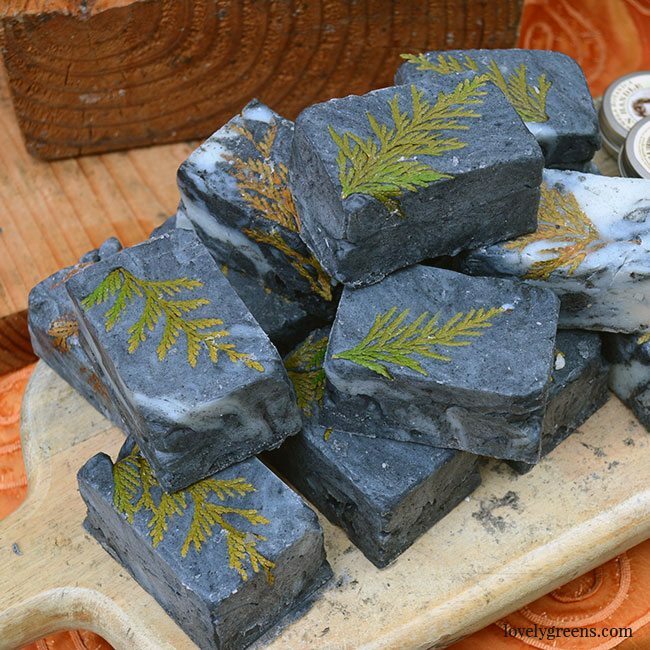 When fully mixed in, pour your soap batter into moulds, place your optional cedar leaves on top. 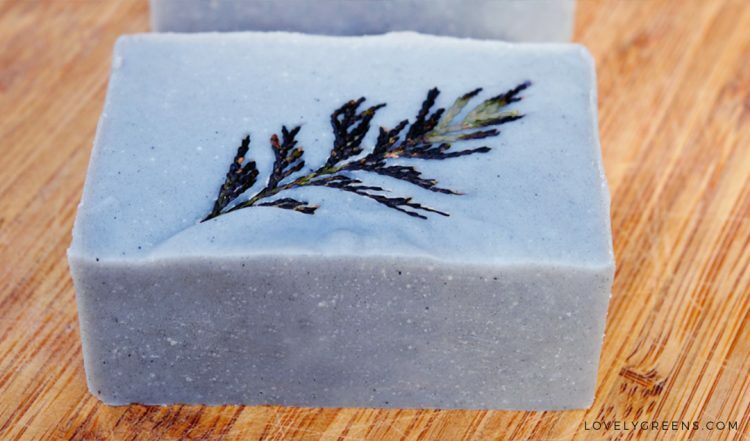 Wherever the leaves touch the soap, the leaves will darken to almost black. 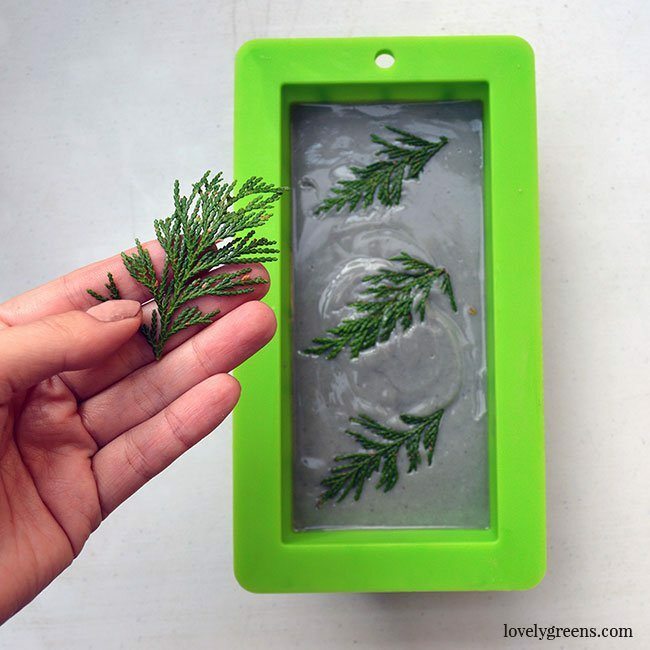 If you want the leaves to stay green you’ll need to press them into the soap after it’s been chopped into bars. Now cover the soap lightly with a towel. The towel shouldn’t touch the soap and its purpose is to keep the soap warm which helps with creating a consistent colour. You leave your soap in the mould for at least 24 hours and if you used Sodium Lactate the soap will be hard after that time. If you didn’t, the soap will have hardened but it will still be soft around the edges — the soap might stick to the mould when you try to push it out. Best wait a few days before trying and/or pop the mould into the freezer for half an hour beforehand. I’m sure that you and any of the recipients of this soap will be pleased with end product. It smells woodsy yet fresh and has a natural blue-grey tint. Best of all, you’ve made it all by yourself! Any oil can substitute cocoa butter and sunflower oil as I don’t have these on hand? Thanks. Never try substituting oils in a soap recipe unless you’re experienced in making soap. The amount of lye in a recipe will differ based on how much of each type of oil is used. Each oil has it’s own saponification value, meaning it needs a specific amount of lye to convert into soap. If you try substituting oils then your soap could fail or even worse, be unsafe. 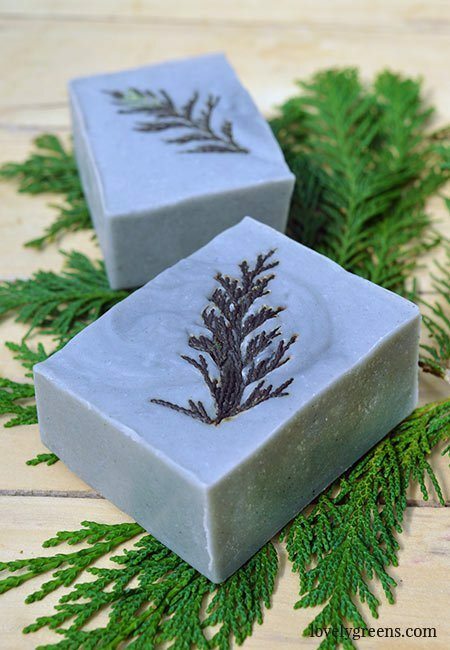 I’m eager to try the cedar leaves on top of my soap. What other leaves do you think would work well. It’s winter now, so are there leaves I can find in the supermarket that would do? Tanya, can I use just cedarwood eo? I don’t have cw atlas….. This sounds like a great recipe! Can it be made by hot process? Yes! Most (if not all) cold process soap recipes can be made using the HP method. So if you use the melt and pour , you don’t use the lye? Love the sound of this one, it will make a nice change from the usual florally scents. Thank you for the great recipes. You seem to use quite a low amount of EO’s, do you find that the fragrance is still good after the cure? It’s a very good amount and yes, the scent is great. You really don’t need any more essential oil than 2-3% of a recipe and you actually cannot sell soaps in the European Union that contain more.